Sam Berns was a 17-year-old student from Massachusetts who dreamt of playing in his high school's marching band. But, unlike other students, he was diagnosed with the rare, rapid ageing disease progeria (when he was just two years old. Progeria (Hutchinson-Gilford Progeria Syndrome) is a rare and fatal genetic condition which is characterized by an appearance of accelerated aging in children. Most children with Progeria do not live past their teens. 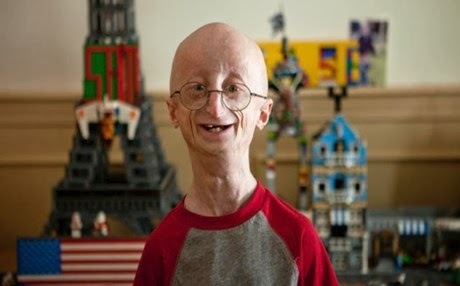 On January 10 of this year (2014), Sam died due to complications from Progeria. In a speech to TEDx in October 2013, Sam discussed his philosophy for a happy life. He told the audience: "Be ok with what I ultimately can't do, because there is so much I CAN do." The TEDx video was posted online in December, just about a month before Sam passed away, aged 17 years old. Sam touched the hearts of a lot of people while he was on this planet, and through this presentation he will continue to do so. Sam gives us some good advice, but he also demonstrates how to tell your story in 12-minutes in a way that is simple, clear, and engaging.